R1b-U152/S28 : more Gaulish or Roman ? View Poll Results: Who spead R-U152 ? Thread: R1b-U152/S28 : more Gaulish or Roman ? Interestingly its presence in Iberia is mostly confined to Catalonia. In England it is almost exclusively found in the south, where it can exceeds 10% of the lineages. It was obvious before that U152 was virtually absent of northern Germany, Scandinavia and Eastern Europe. But a sizeable pocket has been found in western Poland. The last noteworthy observation is that U152 is very strong in both Corsica and Sardinia. I have so far supported that R1b1b2a1 represents the Italo-Celto-Germanic people, i.e. the branch of the Indo-European speakers from the Pontic steppe that settled in Central Europe and dispersed all over Western and Northern Europe. In this theory, R-U106/S21 represents the Germanic branch, and R-P312/S116 the Italo-Celtic branch. As such U152 is a branch of Italo-Celtic. But does it represent more accurately the Italic branch alone, or not ? In the last two and a half years I have equated U152 with the Alpine Celts, and more specifically the Hallstatt and La Tène cultures, that radiated from southern Germany to northern Italy, France, Belgium and southern England. If you compare the map of U152 with that of the Hallstatt/La Tène culture, the correlation is evident. The only areas that don't match are north-western Iberia and Italy. North-western Iberia was part of the La Tène culture, but only has a low percentage of U152. This can be explained simply: a small group of La Tne Celts migrated to N-E Iberia and exported their culture there while being genetically absorbed by the locals (other Celts). But what about Italy ? If U152 was indeed associated with Hallstatt and La Tène Celts, why is it so common in the Italian peninsula ? 1) The first possibility is that Celts moved in great number to Italy. This has been historically documented by the migration of the Gauls to northern Italy, which the Romans renamed Gallia Cisalpina. Just after the Roman conquest of Gaul and southern Germany, hundreds of thousands of Gauls were taken as slaves to Italy. In the following centuries, as they became integrated in Roman society, many more Gauls moved to Italy for business or politics. It is also documented that numerous Roman senators were of Gaulish origin. Once they have reached the top level in government, it is easy to imagine that just anybody from Gaul could settle in Italy (and vice-versa, as countless Romans established themselves in Gaul). This is all very well, but it doesn't really explain why R-152 is so strong in Corsica and Sardinia. These islands were not settled by any migrating Celts that I know of, and their remoteness and little political or economic importance did not make them prime destinations for Gauls to settle in. Additionally, Myres' map shows that U152 peaks around Umbria and the Latium but is weaker in Alpine Italy. This could be because Gauls migrated en masse to Rome, or because so many of them were taken as slaves to Rome. But it could just as well be because U152 was actually Roman to start with. 2) This leads us to the second hypothesis: Italic people were an early offshoot of the Hallstatt Celts, and therefore all Italic tribes, including the Romans, carried a high percentage of U152. 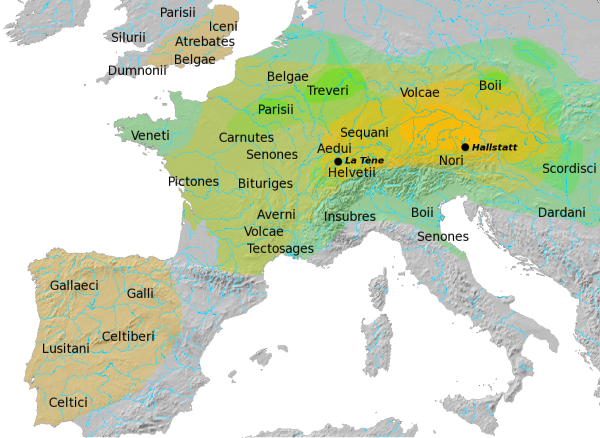 The migration to Italy might have happened at the beginning of the Hallstatt period (circa 1200-1000 BCE), or just before, during the Tumulus culture (see maps). I think that the answer is surely a combination of both hypothesis. U152 has numerous subclades, and some might later be identified as Roman, or at least Italic, while others will be exclusively Gaulish or North Alpine. So far data is too scarce to see any pattern. The main subclade of U152 is L2, which is found in roughly 3/4 of all lineages, but indiscriminately anywhere from Italy to England. Interesting stuff, I'm wondering if the U106 is the Veneti tribe marker, that existed for some time where today's Poland is, before Slavic expansion. Possibly part of the tribe that settled around today's Venice. I'm surprised that Czech republic is U106 desert, though they are rich in R1b overall. I'm still waiting for more information on my Y DNA to find out if I am SRY2627 or just R-P312/S116. Since my German speaking ancestors were from Switzerland I assume they must have stopped there when the rest of tribe moved on into Iberia and France. Perhaps the R-152 in Sardinia and Corsica is from a founders effect from early migrants. Interesting. Given this new data, what are the preliminary knock-on implications for U106, in anyone's opinion? Sorry, I meant U152 present in Poland, as per map. It will be interesting getting subclades for Venice area and Poland to see if there are matching ones. When you look at Normandy, second map, there is also a Celtic tribe called Veneti. We might had same celtic/sea fairing tribe in 3 places: Venice, Normandy, and Poland; all by the sea. If we can find same subclade of U152 in 3 of them, then bingo! ive contact with the people of igenea. They say, there more genetic difference between the celtic R1b-S28 and the italics. They had analyzed the genetic marker and allels (i dont know the exact english word for it) of the profiles and can say, which profile is typical celtic or italic. Also they analyzed more difference between the germanic and nordic (northgermanic). typical mixture of germanic (continental). But the nordic (northgermanic) are most I1 and R1a. Igenea also analyzed the profiles and they say, there before a viking-profile, a nordic-profile and at the same time in the south a seperate germanic-profile [seperate profiles of I1, I2b, R1b and so on]. Also they compared the germanic (not nordic) profile and the celtic profile. A scientist there find out, that the germanic and celtic had most 4-allels together. At result my personal meaning is, that the most germanic (not nordic) as pre-celtic people (R1b1b2a1) looks more like celts, than the germanics who f.e. tacitus (his personal meaning is like the other mediterranean author at this time; but not the reality) describe. I seriously doubt so. Subclades of R-S28 (U152) do not show any particular geographic pattern. For example, the main subclade, L2, is found in roughly 3/4 of all R-S28. There is no significant differences between English, French, Belgian, German or Italian samples. L2+ and L2- are found in about the same proportion everywhere, which indicates that this mutation surely predates the split between Italic and Celtic tribes. I have looked at STR variances, but have not found anything conclusive that would split Italic from Celtic. Actually we won't know until hundreds of ancient DNA samples are tested, because all Gaulish Celts were completely taken over by the Romans. Therefore, any R-S28 in Gaul (meaning France, Belgium, southern Germany and northern Italy) could be either Gaulish Celtic or Roman. Southern England, where R-S28 is also found at high frequencies (about 10% of the population) could be of La Tène Celtic origin, or Roman. This doesn't help us either. Furthermore, iGenea does not have a good reputation when it comes to associate haplogroups or haplotypes with ancient ethnic groups. There has been many complaints (notably on dna-forums.com) that iGenea gave completely 'fanciful' (to stay polite) interpretations of ancient ethnicity in their reports. I remember reading that they consider G2a3b1 to be a Germanic marker (or all the possibilities this is one of the more far-fetched), or that mtDNA H could be Celtic, Germanic, Etruscan, Illyrian or Hellenic (among many others, how helpful !). They also give names of specific Germanic tribes, which is also completely fanciful and unprofessional, as there is absolutely no way of distinguishing their Y-DNA at the moment (or perhaps ever). If it is achievable one day, it will be through very deep subclade (not yet discovered) or very high STR analysis (over 100 markers) and only after hundreds of well-identified ancient samples have been tested for each tribe. It's a titanic task and I don't expect it to happen before several decades from now (unless new faster and cheaper methods of testing ancient DNA come up quickly). Well, one idea that crossed my mind on multiple times, which actually might explain this pattern is the idea that what we perceive as "Celtic" languages is actually paraphyletic. You may be well aware of the infamous 2009 paper by Koch et al. which proposed that Tartessian was actually an Celtic language, and that the Atlantic Bronze Age was the origin of the Celtic languages. Now, the idea that Tartessian was Celtic can be thoroughly debunked, however, I give the Atlanticist school some credit in so far that they are probably right about one thing: Hallstatt/La-Tene alone cannot explain the thorough presence of Celtic languages in the Atlantic region by the time that the Classic sources start to mention it. - first, the complete absence of west-to-east movements from the Atlantic Bronze Age into Central Europe. Basically all the movements of innovations go out from Central Europe into the Atlantic Façade where they disperse, not vice versa. - second, if the Atlantic Bronze Age was Celtic, what do they make out of contemporary Urnfield culture? Iberian? Etruscan? Germanic?! The fact that the Atlanticists are totally silent on the issue (read: they seem to just don't care) makes me suspicious that this hypothesis is not proper science, but politics. - third, they totally ignore the very existence of the close relationship that exists between the Celtic and Italic languages. - fourth, the very existence of languages which are neither Celtic nor Italic, but definitely closely related with the two families, ie Lusitanian (in Iberia) and Ligurian (in northern Italy). - First, there was a common Italo-Celtic stage from which the Proto-Celtic and Proto-Italic language split. - Second, the Celtic and Italic languages did some common innovations after Proto-Celtic and Proto-Italic actually split. - Third, these are merely archaisms that have been lost in other Indo-European languages. However, most linguists will agree that while some of the commonalties of the Celtic and Italic languages are certainly archaisms, the bulk of them are actually actually innovations the two families have in common. So, even if you assume that a common proto-language stage did not exist, this demands for the development of the two language families in close geographic proximity. This, obviously, favours an origin of the Celtic languages in the Alpine (Hallstatt/La-Tene) region, and not in the Atlantic Façade. However, perhaps a bit of both Italo-Celtic scenarios actually did happen. My suggestion, which would reconcile the problems we see (especially in respect for the Atlantic Facade) is the following: an early split between "Atlantic" Celtic languages (from which the archaic varieties of Celtic later evolved - in particular Gallaecian and Goidelic) and a common Italo-Celtic language. From the latter, Gaulish (or possibly Gallo-Brittonic, I don't know about that one?) on the one hand, and the Italic languages on the other hand evolved. Also, in this scenario it's possible that some of the Atlantic languages (ie, the Brittonic branch) did common innovations with Proto-Gaulish (notably the Q to P shift) despite having already split from it. In this scenario, U-152 would indeed be associated with the Italo-Celtic (or, if you will "Italo-Gallic" might be more appropriate), and the scenario would perfectly explain why U-152 is associated with the Hallstatt/La-Tene cultures and with the Italic peoples. Last edited by Taranis; 25-09-10 at 15:08. No, they dont define it with the haplogroup. The scientists from there know, that haplogroups and ancient groups were not the same. and could say, if it special for a ancient group. There are for every haplogroup (and subclade) specific profiles. F.e. nordic profiles of R1a, I1, R1b, so for every haplogroup, but the profiles dont base on the defintion of haplogroups. But there is an interesting thing about roman soldiers. It was typical for them, to go back to italy after the battle or assimilation. Also remember, that the romans where a mix and not only R1b people. So i and iGenea dont think that there are many roman blood out of italy. A former scientist of iGenea says, that we find nearly no italic dna in other countries out of italy. Its because of the points of the secound sentence. But also think about the fact, that it was your personal interpretation of the haplogroups and there are also other people and scientits, not just you, who interpret the subclades of the haplogroups. So i couldnt understand, why you say the italic and celtic where both R1b-S28. You dont know whether (and sure) the ancient italic realy were R1b-S28, because in Northern Italy settled many many celts(the most very late). Also we hadnt assigned all subclades to ancient groups. So there could be one or two subclades of R1b1b2 which are typical for italics. Also think about the fact, that in the time of the late roman empire many gaulic soldiers were in the army of the romans. A roman mustnt be compelling a genetic italic or etruscan. There were so many ancient groups which romans were to. Thats a misunderstanding. They dont match haplogroups with ancient groups. The analyzed profiles which are typical for specific haplogroups. But for this process they dont use the defintions of the haplogroups. For me its difficult to explain it in english for you. So i and iGenea dont think that there are many roman blood out of italy. A former scientist of iGenea says, that we find nearly no italic dna in other countries out of italy. Its because of the points of the secound sentence. Sorry, but iGenea is a really bad company. Their interpretations are almost pseudo-science and amateurish. What the hell is " italic dna" ? Their interpretations are not pseudo-science. Its a daughter company of family tree dna. With "italic dna" i mean typical italic subclades or profiles. There are not typical italic subclades. The most common subclades in Italy are also common in Western Europe. I's bull. Because we couldnt assign all subclades to the ancient groups. And we dont know all subclades. Yes I agree with you Theodisk Why we have always here these kind of " informations" about "R1b1b2" and subclades to definite the Celts the Germans the Italic etc ... The Romans or Italics were J2 G2a I R1b1b2 etc ... When I read that ITALICS = one suclade of R1b1 sorry but this is idiot ! R1b1b2 is very old on the west of Europe the paleolithic or the neolithic it has nothing to do with the steppe and the "Indo Europeans" if IE means something when we talk about a IE people ? STOP please with this washing brain of R1b1b2 and the steppes and IE and etc ... STOP these interpretations . For those you can't read properly, I never said that all the Gaulish or Italic people were R-S28. They obviously included many different lineages, like J2, G2a, E1b1b, etc. This thread is only about trying to determine where R-S28 originated, what ancient group spread it to the places where it is common today. Starting from an ancient ethnic group and trying to guess what haplogroup they belonged to is the reverse process ! Saying that the Bretons are French is not the same as saying all French people are Bretons. Saying that the R-S28 are Italo-Celtic is not the same as saying all Italo-Celtic people are R-S28. What I wonder about on the map with the distribution of R1b-U152 is the area of Austria and Bohemia. This was the heartland of the early Hallstatt culture, but U152 is relatively rare there today. Could this be an artifact of the migrations period, or the sign of some completely different pattern? But we should differentiate ancient italic from "modern italics". The italics were indo-europeans and the first romans were etruscans. So italics were since for not so a long time romans like the etruscans. Latin were the main language of the romans, but before, the first romans spoke a language of the etruscan, because they were etruscan and no italic in view. Maciamo, why did you wrote that R-M228 were Alpine Celtic? Most we found in northern italy. It is very possible that this was a only italic subclade. It could be that a part of R-S28 people were italics, but i think only a very small part. Because after the R-S28 happend other mutations and they are younger than R-S28. So its possible that the R-M228 was a near only italic subclade. You wrote that the italic helmet were copied from the alpine celts. But this was few hundred years later, mostly at the early L�-Tene time. There are no connection with genetics. - Urnfield influence enters into Iberia via the area of Catalonia (around 9th or maybe 8th century BC), from where it disperses into the west. Of course, by the time that Classic sources start to mention the area, the area of Catalonia is firmly Iberian-speaking, and the Celtic-speaking Celtiberians are located only to the west in the Ebro valley. This paradox may be explained by the idea that the expansion of the Iberians into the area happened after the 8th century. Indeed, the Northeastern Iberian script is attested only from the 4th century BC onward (probably created under Greek influence from the Southeastern Iberian script). - The Polish peak may be explained by the Lusatian Culture, which also was part of the Urnfield tradition. We obviously don't know what language they spoke, but it's conceivable to have been a Indo-European language related with early Celtic. - The Italian peak (centered around Tuscany/Etruria) may be explained by the Villanovan culture, which is notable for burial rites similar to the Urnfield culture. Obviously, the relationship between Etruscan and the Italic languages, but it appears the Villanovan culture was an ancestor of the Etruscan civilization. It has also been suggested that the Q-to-P shift which occured in some Celtic and Italic languages occured under Etruscan influence. What's also been suggested is that the Etruscan civilization has dual origins. - The Urnfield Culture evolved further into the (possibly proto-Gaulish speaking) Hallstatt Culture, which remained in contact with the Etruscans. Later (with the emergence of La-Tene, which is previously just peripherically to the Hallstatt Culture) there is the power shift from the east to the west, and probably U-152 expanded greatly westwards into later Gaul during this period. - Expansions of the Gauls into northern Italy (Cisalpine Gaul) leads to a further enrichment of U-152 in northern Italy. - As Maciamo suggested, slavery during the Roman period may have enhanced U-152 in Italy even further. - The only thing not explained by this scenario above is the relative rarity of U-152 in Austria and Czechia. Based on Urnfield/Hallstatt/La-Tene influences, it should be much more common there. It's possible that some later events (Marcomannic invasions, Slavic migrations) are responsible for U-152 becoming so rare in the area. This scenario also works with the Italo-Celtic relationship I mentioned above. So... what are your thoughts? - The Urnfield Culture evolved further into the (possibly proto-Gaulish speaking) Hallstatt Culture, which remained in contact with the. Later (with the emergence of La-Tene, which is previously just peripherically to the Hallstatt Culture) there is the power shift from the east to the west, and probably U-152 expanded greatly westwards into later Gaul during this period. Also note the fact, that the north-urnfield-culture evolute to the harpstedt-nienburger-culture and jastorf-culture. The central-urnfield-culture evolute to a part of the harpstedt-nienburger-culture (which was a cultural bridge to jastorf and hallstatt) and to the hallstatt-culture. It could also be, that alpine celts have a strong influence to non R-S28 italics (when no italics were R-S28) and they assimilated them and their dialect evolute to the italic languages. Later some R-S28 alpine celts would assimilated by italics, so this is the possible, why we think some R-S28 were also italics. Mind you, U-106 must have been also very common in northern Germany. Indeed, in the Lichtenstein Cave (which we cannot yield to be too representative of the time/area, anyways), we find R1b-U106 inside the Urnfield context. Still, it's conceivable that (Proto-?) Celtic influences was responsible for shaping the Germanic languages, and perhaps also responsible for the split between North Germanic and South Germanic (which would have happened in the Jastorf area, anyways). Also, what still eludes me regarding the distribution of R1b-U152 is Corsica and Sardinia. I have no explanation for that yet. Ich can say you why in corsica and sardinia were so much R1b-U152. Because when corsica would a part of france, many french people come to corsica. The demography of the native-corsican is very bad, so the genes of the french (with most R1b-U152) are dominant of corsica. Its fact. A friend of my parents is a real corsican (with french ancestors) and his wife a austrian. So many corsican with french ancestors, live on corsica. The statistics about the haplogroup distribution are from the new-time. So do you understand what i want so say? How exact it is on sardinia, i dont know. But i think we must include modern migrations, because all the haplogroup statistics, dont exclude this migrations f.e. since the 18. century. I came across the Maghreb Y-DNA Project and had a look at the R1b results. The presence of 1 to 5% of R1b in North Africa is still fairly mysterious due to the absence of detailed study on the subclades of R1b found in that region. This is why I was glad to find that one of the project members tested for subclades and happens to be R1b1b2a1b4c (U152+, L2+). I checked the STR values of other R1b's and they all seemed quite similar and could well be R-U152+. That is what I expected. In other words it means that Maghreban R1b is of Roman/Italian origin. The presence of U152+ in the Maghreb also reinforce the hypothesis that the Romans carried this haplogroup, and that the U152 in Italy is not exclusively of Celtic origin. If R1b1b2 had come to Europe during the Neolithic expansion, it would most likely also have reached North Africa during that time, based on the pattern of diffusion of agriculture along the Mediterranean (see map). We would therefore expect to find a trail from southern Turkey to Greece, Italy, the Maghreb and southern Iberia. The only common trail is the presence of E1b1b, J2 and G2a. R1b is present in all these regions, but in very different proportions and the subclades are completely different. U152+ is very rare in southern Turkey, minor in Greece, omnipresent in Italy, apparently the major type of R1b in the Maghreb but very low in frequency, and minor in Iberia despite the huge percentage of R1b. A Neolithic spread of R1b would involve that all the older subclades of R1b1b2 be found in the places settled earliest, and a new trail showing an northward expansion from southern to northern Iberia, southern to northern France and across the Channel to Britain. That is simply not the case. The fact that U152+ appears to be the main subclade in the Maghreb is enough to rule out the presence of R1b among the Neolithic migrants that left Greece for Italy, North Africa and Iberia. Otherwise southern Spain and Portugal would also abound with U152+, but they don't. If R1b1b2 originated in Western Europe during the Paleolithic or Mesolithic, the highest diversity of R1b subclades would be found in Iberia and southern France, and all subclades would radiate from there. Instead what we see is that the oldest subclades of R1b1b2 are found around Anatolia, the Caucasus and Central Asia, then all subclades from R1b1b2a1 radiate from the Alps, along with the diffusion of Indo-European languages. The Italic language branch is the most distinctive in the Italo-Celtic group, and matches U152+. Once again, if R1b-U152 is the main type of R1b in the Maghreb, it fits the Indo-European migration model best because Tunisia and Algeria were heavily colonised by the Romans, the main carriers of U152+. The low overall percentage of R1b in the Maghreb (max. 5% + the Roman J1, J2, G2 and E1b1b, for a total of perhaps 10%) is also consistent with a colonisation pattern, rather than a massive migration or resettlement. The Phoenician having settled in the Maghreb too, I would expect to find the typically Levantine type of R1b too (namely R1b1a, M18+). looks like a spread that started somewhere from 2 hotspots one within east germanic tribes, and one within west germanic tribes, and that later spread over areas of Frankish empire.. The Burgundians were extending their power over southeastern Gaul; that is, northern Italy, western Switzerland, and southeastern France. In 493 Clovis, king of the Franks, married the Burgundian princess Clotilda (daughter of Chilperic), who converted him to the Catholic faith.